Five years ago this week, Cream reunited in a four-night stand at London’s Royal Albert Hall, heralding the first time that Jack Bruce, Eric Clapton, and Ginger Baker had performed full concerts together—and apart from their three-song set at their 1993 Rock and Roll Hall of Fame induction, the only time to date—in nearly forty years. The unlikelihood of this monumental happening, widely considered among the most anticipated reunions in rock history, was staggering on many levels. For Jack Bruce in particular, though, such a feat was nothing short of extraordinary. Authorized by and in collaboration with the music legend, Jack Bruce: Composing Himself offers a riveting portrait of a life lived in near-constant, creative pursuit. And while his fleeting, two-year tenure in Cream no doubt overshadows what has otherwise been an extensive and incomparable career, its lineage—from his earliest days as a member of the Graham Bond Organization and Manfred Mann as well as his later stints with Robin Trower and West, Bruce, and Laing—is chronicled with encyclopedic depth and striking, often-poignant retrospection. 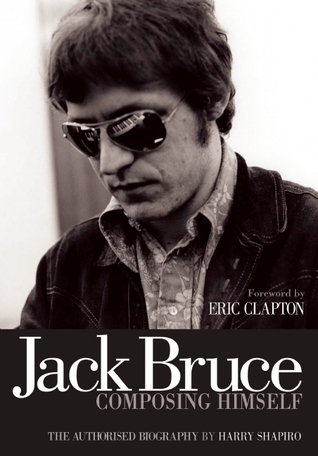 As author Harry Shapiro eloquently suggests, the music of Jack Bruce—and for that matter, the circumstances both triumphant and tragic that have informed it—is one well worth appreciating. As you mention in the book, this is the first biography you’ve written in collaboration with the subject. 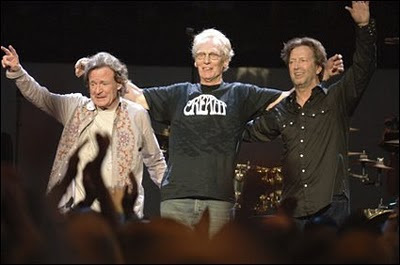 Was it difficult to get Jack Bruce to be a part of it? No, no. Quite the reverse. It took me by surprise, really. I sent him an email back in the summer of ’07 and said, “You know, I really think it’s about time there was a decent book about your life and career.” And back came an email, almost straight away, saying… What he actually said was, “I thought you’d never ask,” which was quite flattering. And away we went. It was no struggle at all to get his involvement. Was he ever reluctant about addressing any significant aspect or event in his career or life? No. He was pretty candid about most things. The one area which he was understandably a bit reticent about was talking about his son, Jo, who died of an asthma attack in 1997. That was really too painful and I really didn’t want to press him too much on that. On one level, of course, what can you say? It’s a terrible tragedy, it came out of the blue, and that was that. But I really didn’t want to delve too deeply into that. That aside, he was pretty candid about most aspects of his life, I have to say. In the acknowledgment section of the book, you thank a list of people—some familiar names, others not so familiar to music fans, but pertinent to the biography—and Eric Clapton is mentioned, [lyricist] Pete Brown is mentioned. Ginger Baker is not. [Laughs] I did ask him. Right at the start I asked him if he would be prepared to be interviewed. And he very politely emailed me back and said that he would rather not get involved. And I can quite understand that, in a way. And to be honest, pretty much what Ginger would say to questions like that was already on the public record. His longstanding sense of injustice about Cream and things like that has all been documented. Yeah, all that kind of thing. And there were lots of stories about various incidents that happened in which Ginger may well have disagreed with anyway, but ultimately it was Jack’s story. So I can’t say I was that surprised when he declined. Like I say, much of what I imagine he would have said was already on the public record. And also, I got some interesting insights from Ginger’s family, his wife and his daughter, Nettie. Jack and Ginger, from early ages through recent years, have had a love/hate relationship yet they still come together to play. In the book, he says Ginger’s the best rock drummer ever. Yeah, and it’s always Jack who’s kind of brought Ginger in on the bands that [he’s] been involved in, the [Jack Bruce] Band in ’89 and BBM in ’94. So Jack’s always been wanting to get Ginger involved. And people have often looked a bit askance when he’s said, “Let’s get Ginger in,” and people go, “Well, isn’t that going to be a problem?” Jack genuinely feels that it won’t be, but quite often it actually turns out that it is. But it doesn’t stop Jack [from] wanting to play with Ginger. And Ginger doesn’t say no. Going back to Jack’s early musical career—up through to Manfred Mann—he seemed as motivated by money as he was music. He almost looked at each endeavor like a tradesman, like a plumber or a window cleaner looking for a job. There didn’t seem to be much glamour. The first thing was he was a professional, working musician. That was his job. One can’t be too romantic about it. This is what all these guys were trying to do—John Mayall, Peter Green, Eric, Ginger, all of them were working musicians. They did hundreds of gigs a year up and down the UK in these rickety old vans, terrible conditions, trying to earn a few dollars a night. So there really was nothing glamorous about the whole thing. The other thing is that Jack did get involved in a number of more avant-garde jazz things with Group Sounds Five and Mike Taylor Trio, for which he probably got no money at all. But on the fringes of the London jazz scene—when he was able to not play with, for example, Manfred Mann, going up there for a half hour every night and playing Manfred’s hits; he soon got bored doing that but he still got paid—being able to sort of stretch out and improvise with other jazz musicians in small jazz clubs, he was equally keen to do that as well. So it was all about playing, it was all about trying to earn some money just to live, because there was no other income coming in. There was no record royalties or anything like that. Most of the money these guys made was from playing as many gigs as they could fit into the course of a year. It seems like such a blue-collar approach. But he wasn’t alone in that. That’s the point I’m trying to make, that all these guys were out there trying to learn a craft, doing what they loved doing. I mean, they could’ve gone off and become builders or plumbers or electricians, but they were musicians. And they knew that it was going to be a struggle. They had to play an awful lot in order to get any kind of decent living. In talking to him, did you sense any regret or sadness that he’s had such longevity in his career, but most people only equate him with a band he was with for two years? I think he’s kind of resigned to that and accepting of all of that. But of course, given his prodigious output over the years, he’d love it if people recognized more of the things that he does. But as I try to put across in the book, a lot of that has been the fault of record companies, marketing people who really couldn’t understand his music. The problem of a business is it’s very much kind of driven by fashion and it’s hard for a purer type of musician to get that kind of exposure and promotion. It has been hard for him from that point of view. But in the course of doing the book, I’ve played people things and they’ve been amazed—the power of his vocals, the complexities of some of his songs, [and] on the other hand some very simple, beautiful ballads. You could do a stunning Jack Bruce album just on the ballads he’s written. So there’s an awful lot there for people to mine. If you asked Jack what he was, what he is, first and foremost he would say he’s a composer. He wouldn’t say he’s a singer or a bass player or a bandleader. He’d say he’s a composer, and from that point of view, you can be composing new songs, new albums, forever until you can’t do it anymore. And a good chunk of why I wrote this book, what I was trying to get across to people—in amongst all the stories about rock ‘n’ roll mayhem, which people like to read and that’s fair enough—is the fact that this guy had a forty-year music career. Cream was less than two years. And he has this hugely impressive catalogue of music that I really want people to just go out and listen to. Get a feel for some of the things that are mentioned, some of the musicians he worked with, some of the routes he took. 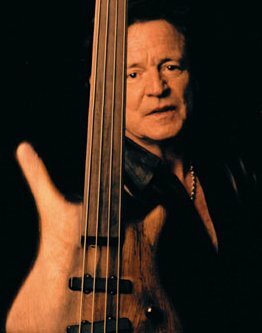 Even reasonably well-versed Jack Bruce fans might not have picked on the albums that he did with Kip Hanrahan and all the Latin guys, which is completely different from the West, Bruce, and Laing and the BBM and the heavy rock kind of thing. He’s done opera, he’s done avant-garde jazz, he’s done big-band stuff. He’s just got this huge breadth, which means in some ways it’s been difficult for people who enjoy his music to keep up, really, because he just dives away into all these different highways and tangents. If something sounds interesting and different, he goes for it. As with all very intelligent, creative people, Jack gets bored very quickly with things and wants to move on to other things.